Steve Saka’s Dunbarton Tobacco & Trust still seems like a very new cigar outfit to me. 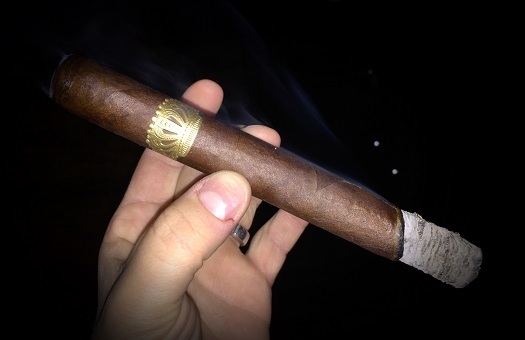 So I was a bit puzzled to realize it has been over a year and a half since the company’s inaugural line, Sobremesa, debuted at the 2015 IPCPR Trade Show. True, that period of time is nothing compared to the history of longstanding industry flagship operations like Arturo Fuente, La Aurora, Joya de Nicaragua, and the like. Personally, though, it feels like Sobremesa arrived long ago, and that the brand is firmly established. Maybe that’s because I’ve smoked a ton of Sobremesa since Saka announced it in July 2015. That shouldn’t come as a surprise; regular readers will recall my fondness for the Corona Grande, Gran Imperales, and—especially—the Cervantes Fino. Real estate for Sobremesa has been permanently carved out within my humidor, which is, perhaps, the best complement I can pay a particular line. Until now, though, the Elegante en Cedros (7 x 50) vitola has eluded me. It’s an extension that was added in 2016. As its name suggests, it comes wrapped in cedar. Like its Sobremesa brethren, Elegante en Cedros boasts an Ecuadorian Habano Rosado wrapper, a Mexican binder, and a filler blend of Pennsylvania Broadleaf Ligero with four different Nicaraguan tobaccos (Gk Condega C-SG Seco, Pueblo Nuevo Criollo Viso, La Joya Estelí C-98 Viso, and ASP Estelí Hybrid Ligero). It is made at Joya de Nicaragua. Beneath the cedar is an oily, velvety, toothy, slightly reddish wrapper leaf with minimal veins and tight seams. The cap clips easily to reveal a smooth cold draw. At the foot, the pre-light notes are cocoa powder, earth, and caramel. Saka does not subscribe to the blending strategy of trying to make all the vitolas within a line taste as close as possible; rather, he tweaks the core blend to maximize the performance of each format. He calls Elegante en Cedros “the ultimate expression of a sophisticated vitola,” and cites the format is—along with the Short Chuchill (also an extension frontmark)—stronger than the original six sizes. Out of the gate, Elegante en Cedros is what I’ve come to expect from the Sobremesa blend, but with an added kick of nicotine and concentration on the palate. Flavors include cocoa, cedar, café au lait, baking spices, creamy caramel, and white pepper. Balanced, harmonious, and delicious. As the white ash builds off the foot and the straight burn moves towards the inch mark, the intensity and spiciness ramps up a bit, though the body still remains in the medium range. Hints of black cherry and cream come and go as the core leans towards stronger cedar and pepper. Beyond that, I noticed few profile changes throughout the 90-minute smoke. Elegante en Cedros retails for $13.50 and comes packaged in boxes of 13 (cheers to Saka for forgoing the 25-count box presentation for this vitola, making a box purchase more affordable). I may still slightly prefer the Cervantes Fino, but this is another exquisite Sobremesa smoke that’s not to be missed. I award it an exemplary rating of four and a half stogies out of five.